The technologies that go into Océ products always seem so straightforward and logical once they are production-ready. But the inventors have many interesting stories from behind the scenes. Sometimes an idea comes in a quiet moment when you least expect it. Sometimes it takes patience and perseverance to develop an innovation into something we can really use. A few of the Océ technology specialists share how some of the company’s technologies were born, and how they are helping Océ be ready for the future. In 2004, Océ wanted to create more productive printers than the company could manage with regular UV inks. At such high speeds, ink droplets were pooling together, distorting the image. The solution presented itself one morning under the shower: add a gelling agent. The UVgel project had several false starts. The original printer it was intended for was cancelled. UVgel was put on ice until 2012, when it was resurrected as candidate ink technology for what is now the Océ Colorado 1640. To meet changing customer needs, Océ switched gelling agents from matte to glossy. And the result is great: high productivity and amazing colors. Moreover, the team switched to more modern UV LED lamps, with much less heat output, so that they can also print on heat-sensitive media. And they optimized the ink recipe to enable odorless prints. These are 3 examples of serious challenges that the team tackled successfully during the development. And they are well recognized by customers. Océ has something really special with UVgel. It is widely applicable, and provides a solid basis to grow in industrial applications. 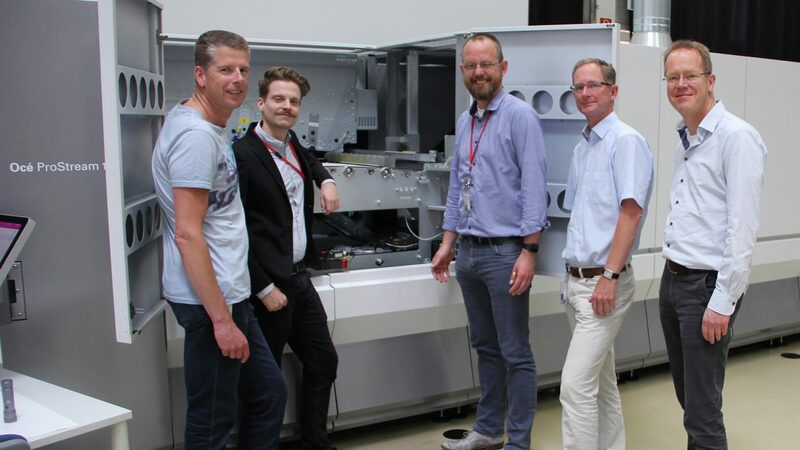 In 2008, Océ R&D in Venlo went full speed for piezo latex inkjet. First step: developing the Océ VarioPrint i300 with piezo latex inkjet technology. The i300 was a tall order: 300 images per minute, combining existing modules with entirely new print technology. There were definite challenges. At the start, the team was relatively inexperienced with water-based inkjet inks, which became obvious when a hose disconnected and the ink sprayed all the way to the ceiling – twice. The team in Venlo learned a lot from Poing in those days. For example, they started with the same printheads that were used in the first Océ ColorStream products. That was the start of today’s intense collaboration. Piezo latex is cost-effective, fast and productive and has high print quality. It will be the basis for a lot of future products. With UVgel and piezo latex, Océ has the technologies to conquer the entire breadth of graphic arts. The color projects with Canon established PRISMAsync as the second-to-none color controller, and extended Océ capabilities to a wide range of engine types. The perfect preparation for the company’s push into the graphic arts market. Piezo latex for the Océ ProStream: move over offset! The piezo latex inkjet technology, initially developed for the Océ VarioPrint i300, got a real boost for the continuous feed Océ ProStream – to tackle offset-coated materials. The team from Océ in Poing, Germany collaborated a lot with their Dutch colleagues in Venlo. During this project, several Venlo colleagues spent half their time in Poing. The requirements placed high demands on the inks and printheads, so the team had to create a special drying unit. One of the attempts, an infrared-based drier, burned the black patches right out of the paper, while leaving the yellow patches soaking wet. So, if anyone ever needs an infrared-based cutter, they should give the team a call! The Océ ProStream development is essential for the Océ strategy for graphic arts, but also, for example, for packaging, which is the next major move for Océ and Canon. Certain packaging media resemble the offset-coated media for graphic arts. The technology assets developed in the Océ ProStream provide a solid base to further develop on. Almost 3 decades ago, hardware-based printer controllers were running into speed and resolution limitations. Océ came up with the idea to build up pages in parallel, each on a separate unit. After creating a detailed software and hardware concept, the project team convinced their manager in a single presentation. The Scalable Raster Architecture (SRA) was born. Back then, concerns were very different. Would the memory requirements make the printer controller too expensive? Would the Intel 80486 processor have enough graphical processing power? Still, the decisions made – to use standard PC hardware and Windows – served the team well and continue to do so. Rumor has it that a major competitor at the time wanted to buy the technology. Luckily, Océ has several patents to protect valuable knowhow. The concept of SRA works with any printer: cutsheet or continuous feed, toner-based or ink-based, 50 pages per minute or 5000, one-color or seven-color, 240 dpi or 1200. And it is still relevant! For the Océ ProStream, it was very easy to scale to 1200 dpi resolution, Color Grip support and enhanced print quality features. 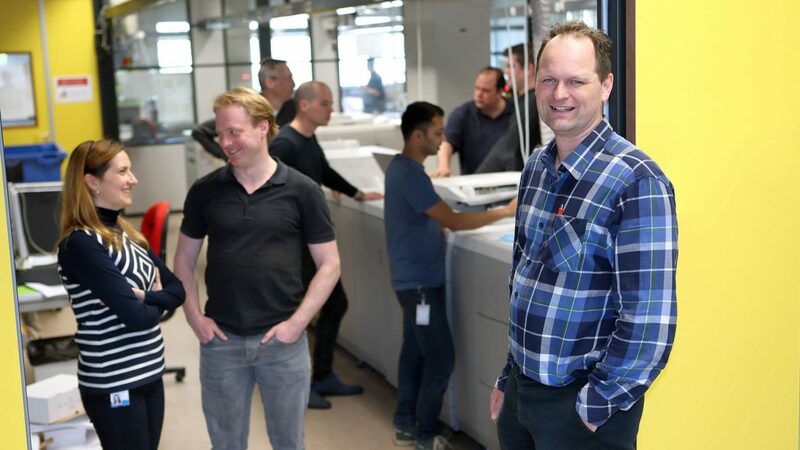 And Océ is ready for the upcoming challenges – able to scale up to 64 units, 10 colors, higher print resolutions and sheetfed printing, with sizes far beyond A0.